Can The 9 Min Comm Method Really See You Generating Commissions In Just 9 Minutes? There’s a lot of different systems making lot’s of different bold claims online which means it can be hard to find the stuff that actually works in among all the… well… junk. This time around it seems to be the turn for the 9 Min Comm system to bring it’s bold claim to the table, which is that it can supposedly “force you to make $233.37/day in affiliate commissions providing you can spare just 9 minutes to get setup”. It certainly sounds like the perfect product – I’m sure you’ll agree… But does it really work or is it just yet another hyped up program which turns out to be full of BS? It’s also worth mentioning that I’m not affiliated with the 9 Min Comm system in any way shape or form – so don’t worry I’m not going to filling you hyped up BS in an effort to try & persuade you to join (like some of the other reviews)… I’ll just be providing you with the hard facts so that you can make your own informed decision. So What Exactly Is The 9 Min Comm Method? 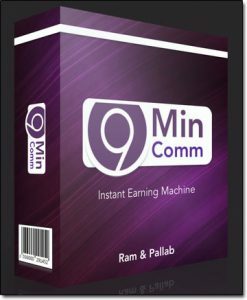 According to the website the 9 Min Comm method is a tried & tested affiliate formula that will enable you to earn money from various networks with ease. If you’re not quite sure what affiliate marketing is it’s basically where you get paid commissions for promoting other peoples products or services. As an example Amazon run an affiliate program and you can earn commissions by promoting any of the products found within their marketplace – though it appears to me that the 9 Min Comm system focuses heavily on promoting digital products such as those found on the likes of Clickbank & JVZoo. Ultimately though you’re going to be learning how to effectively promote affiliate products & make money, apparently even if you have zero experience. How Does The Method Actually Work? Which probably leaves you wondering just what exactly does it involve? The 9 Min Comm system is focused on teaching you how to leverage YouTube to begin generating affiliate commissions by creating videos & learning a “secret trick” to get them to rank high up in the search results. And it’s structured in a way whereby it teaches 2 methods which they call the “Basic Model” and the “Advanced Model”. The basic model revolves around creating videos, publishing them to YouTube and sending visitors straight to affiliate offers. The advanced model is more geared towards creating videos, capturing email address, building authority and then sending people to affiliate offers. Can You Really Make Money In 9 Mins (Or Even 24 Hrs)? Theoretically you could – but the chances are you won’t, at least not without an awful lot of prior preparation. There are lot’s of people making good money from YouTube & it certainly can start happening fairly quickly if you know what you’re doing, but I think the idea of generating upwards of $200 per day in just 9 minutes is a little far-fetched. Even with well-ranked YouTube videos (and lot’s of them) it can still take a little while for commissions to start coming in, and I’m talking weeks/months. So whilst I’m confident their method works – I feel it’s being portrayed as being quite a lot easier & quicker than it actually is. Ultimately affiliate marketing, regardless of the methods you use is hard work & takes time. Well the good thing about this system is there is actually some substance to it unlike the majority of the other systems that have launched lately promising the world but delivering nothing. However whilst this is a fairly quality product in respect to YouTube marketing I do feel that the creators have let it down by over-hyping it which is a bit of a shame really because as a standalone YouTube marketing product it could have been pretty hot. I have confidence in the methods taught through the 9 Min Comm system & I’m sure that as a result of following the training you would be able to generate commissions though there’s a slim chance of them coming as quickly as they are promised. I also believe that whilst the training is good, it’s not necessarily the best starting point since it primarily focuses solely on YouTube marketing. If you are specifically interested in learning how to rank videos on YouTube then this product could be a good punt – however if you’re brand new and just looking to get started with affiliate marketing I’d probably say that something like Wealthy Affiliate would be better suited as it will give you a broader overview on various methods.